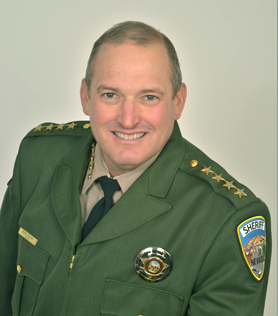 Sheriff Allen is a sixth-generation Winnemuccan, born and raised in Humboldt County and a 1981 graduate of Albert Lowry High School. Sheriff Allen’s career in law enforcement started in 1983 when he became the first cadet with the Winnemucca Police Department. Sheriff Allen served as a police officer with the local Police Department for six years before transferring to Elko, Nevada, to work as an investigator at NDI (Nevada Division of Investigations). Sheriff Allen served as a criminal investigator, where he worked to effectively investigate and apprehend dangerous criminals throughout the Northern Nevada region. In 1993, Sheriff Allen’s leadership and administrative skills landed him a promotion as Lieutenant and commander of a multi-agency Humboldt-Pershing Narcotics Unit. This promotion allowed Sheriff Allen the ability to return to his hometown of Winnemucca. While the commander of the Humboldt-Pershing Narcotics Unit, Allen worked to improve the reputation of the unit. Sheriff Allen worked hard and developed both a training and professional standards plan and a foundation for effective policing. Allen’s work and implementation of creditable and effective law enforcement practices became a model for other law enforcement agencies across the state. In 2000, Allen accepted a transfer to the state headquarters of the Nevada Division of Investigation in Carson City, Nevada. Allen led a number of large, statewide task forces and criminal investigation units. Allen has 13 years of experience in the area of law enforcement leadership, which includes: Narcotics, undercover operations, search warrants, criminal interdiction, writing and administration of grants, personnel management, internal affairs and budgeting practices. After the Sept. 11, 2001 tragedies, Allen was chosen by top law enforcement officials to head up the Nevada State Special Investigation Unit which focused on organized crime and terrorism. Allen served as the Director of the Nevada Threat Analysis Center until 2010. As Director, Allen proved to be an effective liaison between all of the state’s 17 counties. Allen was also one of the top antiterrorism law enforcement officers in the state, where he served as the administrator for the agency, responsible for collecting intelligence and mitigating potential threats to the citizens of Nevada. Allen effectively created, managed and balanced multimillion dollar budgets each of his years as the Director of the center. Allen became a valued leader among not only law enforcement professionals, but also leaders of state, local and national EMS, fire, tribal, National Guard and emergency management agencies through the development of effective partnerships. With over 20 years of effective leadership, management and supervisory experience, Allen saw a great opportunity to bring his background, education and experience back to his hometown of Winnemucca. Allen returned to his hometown where he has served as Sheriff since January 2015. Allen brings fresh ideas and a vision to improve the culture and efficiencies of the local Sheriff’s Office. Allen’s focus for the Office will be to improve training and career development for all employees, institute cost-effective prudent budgeting practices, enhance the scope of protection and services provided by the office, protect liberty and justice and bring about a culture that values, above all, community-based policing and community involvement.